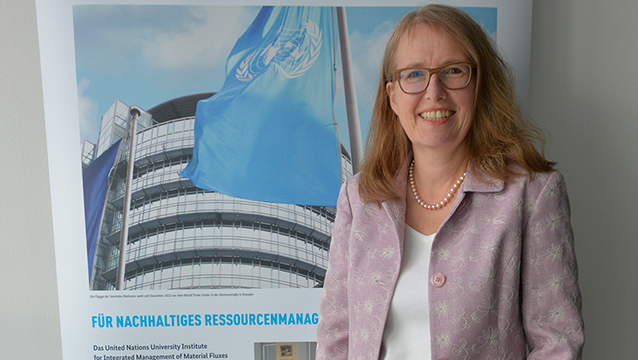 Prof. Edeltraud Guenther, Director of UNU-FLORES, is among the most research-intensive scientists in the German-speaking world in the field of business administration. This is the result of the 2018 ranking undertaken by ETH Zurich and the University of Düsseldorf for the German weekly business news magazine WirtschaftsWoche (WiWo). On methodology, the ranking, coordinated by KOF of ETH Zurich and the Düsseldorf Institute for Competition Economics (DICE), looks at business administration scientists in Germany, Austria, and Switzerland as well as researchers who are born in these countries. It evaluated 860 journals and considered publications from the years 2014 to 2018 as well as forthcoming articles. Prof. Edeltraud Guenther, who was Chair of Sustainability Management and Operational Environmental Economics at Technische Universität Dresden, is ranked 59th in the ranking of the 250 strongest business economists, placing her in the top fifth percentile among her peers. In the lifetime ranking, Prof. Guenther ranks 175th place. Since September 2018, Prof. Guenther joined the multidisciplinary team at UNU-FLORES, bringing in her wealth of relevant knowledge and experience to tackle the issue of sustainable management of environmental resources, enriching the Nexus Approach with her perspective. KOF, in cooperation with DICE, publishes the business administration ranking once every two years.